The Independent Order of Odd Fellows (I.O.O.F.) 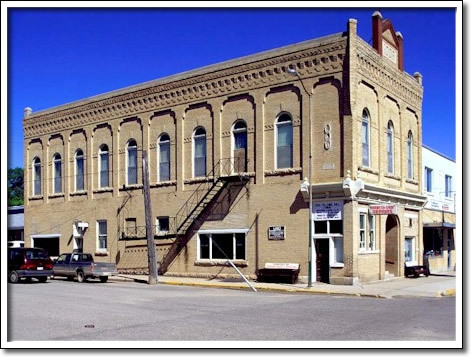 Building is a representative example of a prosperous fraternal organization in a town. Established in 1889, this meeting hall was constructed in 1903 to the plans of Winnipeg architect Hugh S. Griffith. It is the oldest I.O.O.F. building in Manitoba. The façade is enhanced by rows of arched windows, a corbelled brick cornice, and fanciful ornamentation. The triangular roof pediment frames I.O.O.F. As settlers arrived in Manitoba, they established organizations designed to assist members and their families in times of personal and material need. These fellowship groups were generally associated with religious, cultural and social values. Meeting places ranged from leased space to privately owned buildings. Private lodges were generally of modest wood-frame construction, while larger groups erected brick vernacular-style buildings which they let for commercial purposes and social functions. Triple links above the datestone symbolize the Order’s principles—Friendship, Love and Truth.